Showing all 5 posts tagged "story-of-whitestar". It's now five years that Whitestar had been created. Every week (or so), I'll share a Chapter of our Story. 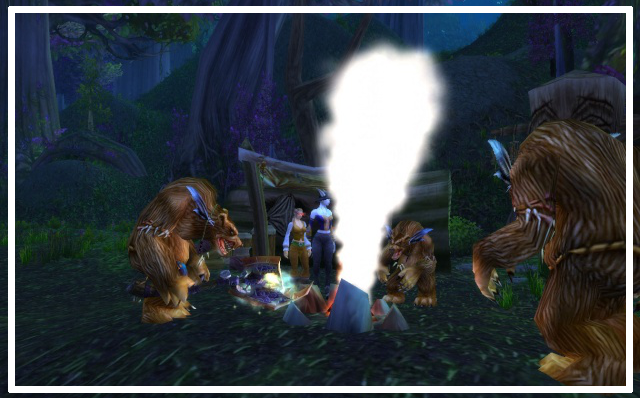 I hope our newest members will find amusing and interesting to learn how everything started.In the last blog post, we remembered the first steps of Whitestar as a true raiding guild. While the Whitestar guild in World of Warcraft entered in hibernation, an hibernation that would last several years, I was hunting for the new game to settle in. I had a bite of Rift, but that game didn't managed to get the interest of @Internet more than two weeks, I had to seek somewhere else. Two games semt promising at that time: Tera and GuildWars2 They still were in devellopement, but I started to follow them closely. 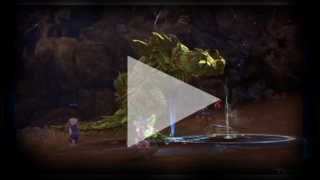 As I was watching a video of Tera's amazing combat on gorgeous landscape, my boyfriend told me that it looked interesting. I didn't need more to be sent on a Crusade. I started by being extremely active on Tera European forum, and seak for informations a bit everywhere. I participated to a contest where we had to create a trailer. That was the first time I used a video editor, and the very beggining of a passion! I also decided to create a solid project for Whitestar, find members that would be as excitted and passionated by the game than I was myself, and hopefully this would get the attention of my friends. I created a recruitment thread to build up from scratch a whole new project. I explained my ideas and the vision I had for our future guild. Very fast, I got several answers. The first person to apply for Whitestar was @torhagen a person with whom I was arguing constantly on Tera forum. We rarely agreed but we somehow enjoyed to argue together. Short presentation : I'm am an Idealist a social and talkative person. I like fantasy and Scifi a lot one of my favourite Movies is V for Vendetta.I'm quite interested in Anime and Mangas Why do you feel Whitestar is the guild for you? I am looking for a Clan that offers a familiar atmosphere like you wrote in your post on the European Forum. Acharial is not part of Whitestar anymore, but for several years he had been one of the key members, shaping Whitestar, and transforming it for ever. Name: Peter, but people call me Chucky. A nickname from when I was really young. Short presentation : I'm currently studying economics and tourism, this is my last year; thank god! Other than that I'm a very social and talkative person. I like reading fantasy a lot and my favorite book series is "A song of ice and Fire". Anime and Manga is also a huge interests of mine. While we were waiting for Tera release, we didn't had much to do beside chatting on forums or in our Skype group, following the news, creating our logo, and our forum signatures...and that was about it! We knew that we would have to wait for a long time before to see our game released. 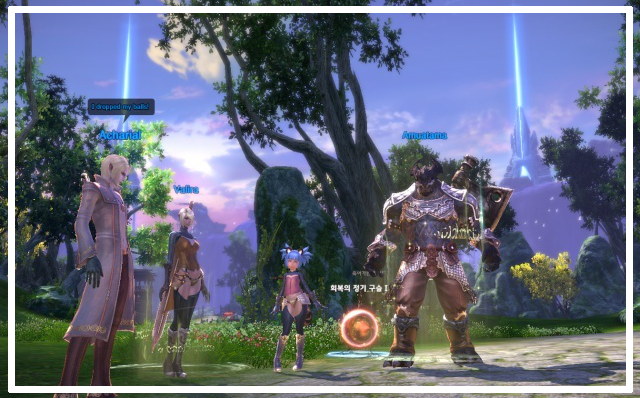 So we decided to join the Korean server and to finally play the game! It was really great, as for the very first time, we could play together, and discover this amazing game that we expected to be our new paradise for the years to come! It's now five years that Whitestar had been created. Every week (or so), I'll share a Chapter of our Story. I hope our newest members will find amusing and interesting to learn how everything started.In the last blog post, we discovered one of the most creative roleplay project of Whitestar: Whitestar Magazine. We want Whitestar to be a place you want to call home! We started the expansion by delving into Dungeons and Heroics together, always in group of five, we only used the relatively new Dungeon Finder to teleport in the dungeon, but we almost never "pugged". Cataclysm heroics weren't as easy as they were in Wrath of the Lych King, or later in Pandaria or even Warlords of Draenor. This difficulty was nice to train as a group, as a team, and to get to know the game style of each others. 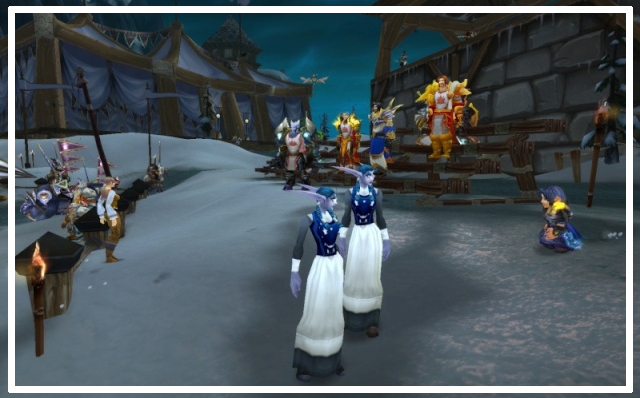 From the members that are still active today in Whitestar, we had @Sharlena playing as a restoration druid, @Alakina as herself, well I mean... a shadow priest, @Internet as a worgen arm warrior, and myself as restoration shaman. While we achieved to gather a nice group of commited and friendly players, we got struck by misfortune. For example @Sharlena had severe internet connection issues and I had a weird problem of FPS during fights using a lot of fire effect. Considering we were trying to progress in Blackwing Descent and that the first boss was Magmaw...it was bad. Very bad. This caused us serious issue to keep our motivations going, as we were spending so much time wiping on fights we knew for technical reasons. Our raiding group was also so tight that once someone was missing, we had no one to replace him or her. We tried to open up our recruitment a bit, and we met some great persons.One of those person was @Chakra. But we also lost several players that weren't interested by World of Warcraft anymore or were called by real life issues. That's when I decided it was time to move on to other games, and made the first attempt into transforming Whitestar in a multigaming community. For the very first time in six years, I decided to stop my subscription. It's now five years that Whitestar had been created. Every week, I'll share a Chapter of our Story. I hope our newest members will find amusing and interesting to learn how everything started. 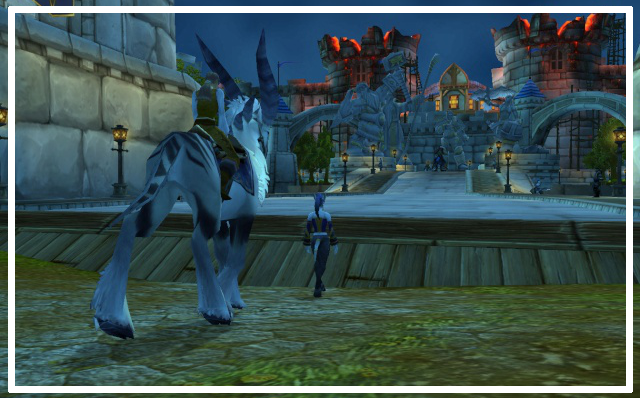 Last week, we discovered the roleplay background of Whitestar and how the guild went unactive for a time. It's amusing how an argument can sometimes bring positive events. The reign of the Lych King came to an end. Most guilds had eliminated the vilain, including Luminous Path, but not with the twin priestess. @Internet and I had raided for weeks and our team were close to victory, but the day of the kill we had been replaced. This left us a sour taste, and we didn't had the heart to raid anymore. We mostly played on our alts, and spoke about the Cataclysmic future. I wanted to play with a Goblin Shaman, while Internet wanted a Worgen. Obviously, we had an argument. So the night of my 31th birthday, I secretly created a Draenei shaman, and started to level her to show my good will to my boyfriend. I choose to pick up my most favourite name to give her importance: Elloa. 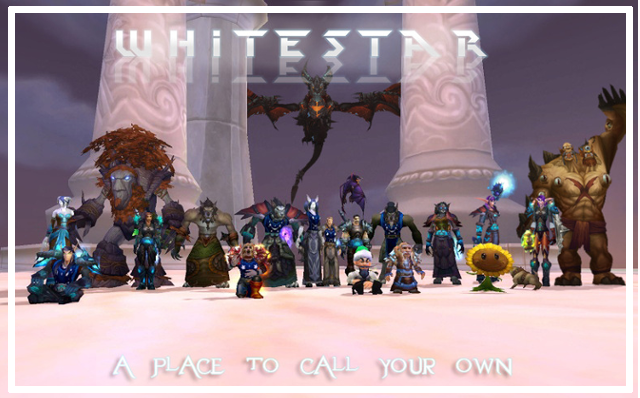 As by this act we settled to play on Alliance for the new expansion release, we asked to our old friends if they would be interested to play in Whitestar again, and to prepare our guild for Cataclysm. Our plan was to have a small tight knit 10 man raiding guild, with optional roleplay on the side for those that wanted. Our idea met a serious enthousiasm, even though most of our friends didn't planed to play World of Warcraft before the expansion released. During the meantime, I started to seriously roleplay my Draenei together with @Alakina. We decided that we would bring back the Whitestar Magazine on a most serious level. 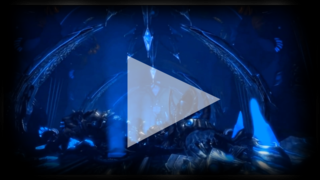 Alakina created a blog for us to incarnate the reporters of Defias Brotherhood and bring all news about what was happening on the server! We had amazing adventures: the discovery of the Furlborg tribes, the exploration and study of the ruins in Ashara with the GAIRDAS Institut, a royal Wedding in the Arathi kingdom, the Theramore Ambassy Gala, or the War ravaging Swamp of Sorrow. And of course the premices to the great Cataclysm that would change the face of Azeroth for ever! We didn't missed a single occasion to write scandalicious articles! Alakina and I spent several weeks to play and work together, and we really had great time. This are memories that I cherish. We never had play that much together in the past, and we never did it again later. This is a particuliar period of our life as friends where we had the occasion to be more intimate. Once the expansion hit we continued to publish the Whitestar Magazine. We recruited several reporters that helped us to provide more content in our pages. We also had regular meeting in a house in Stormwind, that we shared with Ere Argus. It was really fun, but also a lot of work! 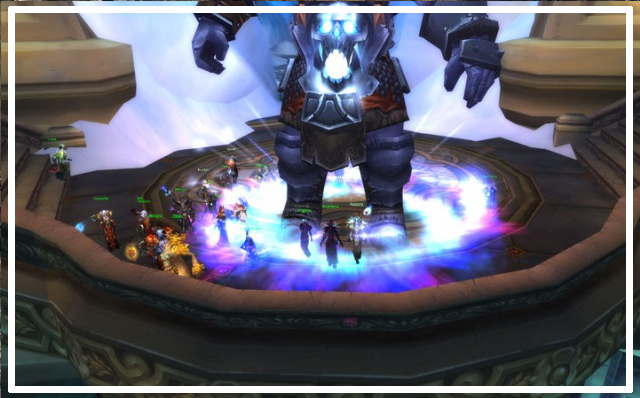 We had to take part of as much event as possible, and Defias Brotherhood was a very active server at that time. 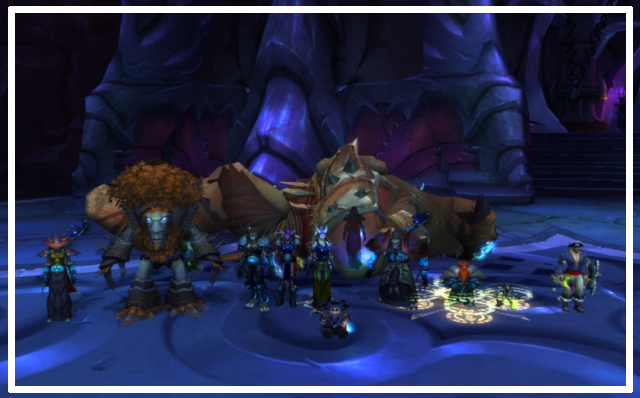 However, as a guild, Whitestar main focus became our PVE progression...How we succeeded in our ten man raids will be a story for next week!